Yes, more of the old IC/RE gentrification symbiosis. 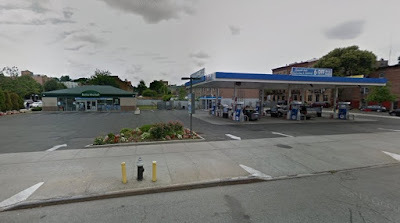 Heritage Equity Partners have recently acquired 861-881 Fourth Avenue (32nd/33rd), last occupied by a gas station & convenience mart, for $19.8M. According to the Commercial Observer, Heritage is planning a "150-unit rental building with a gym, pool and “high-end finishes.” As yet, no building plans have been filed, but Heritage president Toby Moskovits intends 30% of the units to be set aside for affordable housing, which will allow the developers increased building density. Without even getting into the issues of affordability bands & quotas, there's something essentially galling about this kind of project, when new inclusionary housing units come wedded to a (larger) number of new high-end, high-rent ones. Inevitably, the balance of affordable units gained in a community is set unfavorably against the number of affordable units lost as high-end development proliferates, making housing in the neighborhood at large more & more expensive. Certainly it's better to have a portion of inclusionary units in a new development rather than none at all, but the game has a stink about it, and we know the long-term outcome. And who'll get the use of the pool? Update, 7/30. Plans for the eight-story building have now been filed.